Robert and I are here at Rutgers SCILS talking about all things 2.o and having a great time! Marie Radford is here as well so it is a Library Garden reunion. Watch this space for links from the talk! the first of several for Course 502 MLIS Colloquium (Spring 2007). We were honored to be asked to speak and even more honored that so many people turned out on a sub-zero night to hear us talk. As promised, here is a list of links from the talk. We would be interested in your feedback so please leave us comments or feel free to email us. Alexandrian Public Library (Indiana) — promoting library events. San Marino Public Library (California) — documenting a library building project. St. Joseph County Public Library (Indiana) — a variety of sets that range from public to staff events, building updates, new services, and more. Newark Public Library (New Jersey) — a wonderful tour of the unique art and architectural features of their historic main library building. Thomas Ford Memorial Library (Illinois) — lots of interesting sets, but in particular check out their Thommy Ford Abroad set! Librarian Trading Cards (including mine in a tiara). We mentioned a lot of blogs and most (if not all) can be found on our blogroll, so take a peek at who we have listed and start reading. In particular, last night we focussed on Tame The Web and blyberg.net as well as the Ann Arbor District Library web site. Two of the wikis mentioned last night included the Subject Guides at SJCPL and Princeton’s BookLovers wiki as well as the various wikis being put in to place for conferences. I meant to mention, but it slipped my mind, Library Success: A Best Practices Wiki. If you want to have a chance to play with a wiki and contribute content, this wiki is a great place to start. Here also is the link to Robert’s article (in case you need it for future reference) and to the CJRLC Technology Group blog that has the list of links from their January 16th meeting. 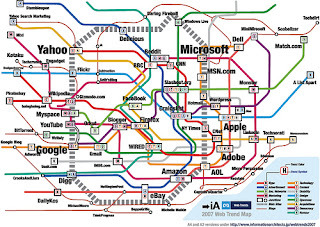 The iA Trend Map shows all the big players, the current Internet trends and how they’re connected, using the Tokyo Metro map. It’s totally unscientific and almost useless, but definitely fun to look at. Also make sure you read the 50 Loudest Web Sites of 2006 report and look at their Internet 2007 Predictions. Note: I think that is everything that we promised to provide links to for future reference. If I forgot something let me know. Or if we mentioned something and you want more details, drop us a line. Entry filed under: Web 2.0. Tags: library 2.0, Rutgers. Thanks for coming to talk to us. I learned a lot, and am feeling more and more inspired to take this Web 2.0 stuff up, myself. I’m especially excited about ideas of how to use it with teens in libraries. It was great. And I’m not just saying that because I won a door prize. Thanks so much for the lively and interesting talk. Someone mentioned that the talk was being recorded for later online access – do you happen to know where that might be accessed? I was referring to the talk and your book reading blog in my “Adult Reading Interests” class, and others would love to find out more. Thanks for your entertaining and interesting talk. I have a question about Blogger. One used to be able to disable the ‘Next Blog’ button at the top. This is a useful trick for younger children. However, the tip in Richardson’s book no longer works. Any suggestions?